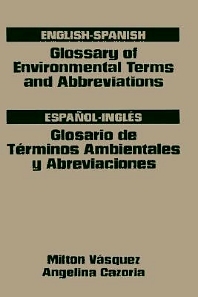 This extensive glossary of specialized environmental terms, acronyms, and abbreviations appear in English with Spanish definitions, and are repeated in Espanol with Ingles definitions. Milton Vasquez has 15 years experience with international engineering and construction companies in domestic and foreign projects. Angelina Cazoria has 17 years experience in human resources, including 14 years with Bufete Industrial, the largest engineering firm in Latin America.